Morgan University Center may be boasting some new technology, but the way to pay will remain the same for students. “We will importantly continue to pay at the common register so that is seamless in the process [APSU] has now,” Fladger said. The paper receipt provided by the kiosks has a bar code that can be scanned by food court cashiers. Sweet additions include an expanded menu that has milkshakes with flavors including chocolate, vanilla, strawberry as well as frozen lemonade. They also boast a speedier check out service, hoping that these new additions will decrease the time spent in line and help ensure the freshness of Chick-fil-A’s food. There are three kiosks in total which stand in the center of the food court in front of the Chick-fil-A. 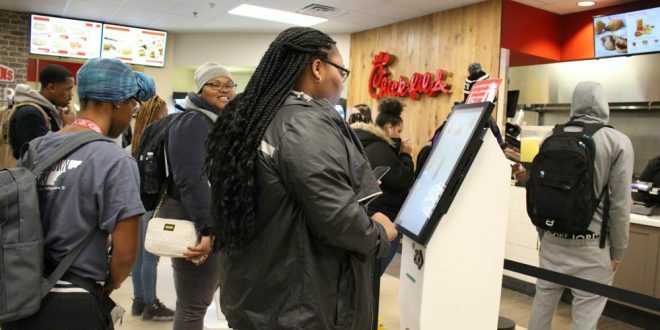 Chick-fil-A is a campus favorite and now Austin Peay students can expect a faster checkout and overall better dining experience with the newly implemented kiosks.